That is the case for Ian Clark (79), who spent six decades flying helicopters and planes all over the world. Mr Clark, whose work included a ship crew rescue off Lancelin, recently retired from an amazing career that included stints in Antarctica, the Middle East, the US and Papua New Guinea. 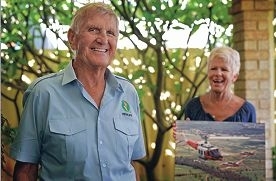 ‘Flying has been 80 or 90 per cent of my life; it’s all I’ve ever done,’ he said. Mr Clarke said he decided to become a pilot after a trip to an aircraft carrier when at boarding school in England. After joining the Royal Navy at 18, Mr Clark went to the US to learn to fly F6 Hellcats on to the USS Monterey aircraft carrier. ‘It’s scary, you’ve got this tiny ship in the middle of nowhere to land on with a tiny deck ” you’ve really got to rely on your instruments,’ he said. Spending a lifetime in the sky does have its hairy moments, including a crash landing on to a factory rooftop in Gibraltar shortly after take-off. ‘Crashes happen so quick, you don’t really have time to be scared,’ he said. In 1956, he converted to helicopters and began flying as a whale spotter in Antarctica before working military contracts in Iran. In the following decade, Mr Clark spent time spraying bananas in the Dominican Republic, and flew in Iran, Abu Dhabi and Bahrain, before a move to WA flying for Burma Oil Company ” now Woodside. In 1969, he flew a Cessna 180 in the London-Sydney Air Race. In 1991, he flew with the RAAF Pearce Search and Rescue squad, and took part in the rescue of the crew of the ill-fated Greek oil tanker Kirki, which lost its bow off Lancelin, spilling thousands of tonnes of oil into the ocean before catching fire. Mr Clark returned to Antarctica in 1996 supporting Australian researchers. ‘It was the most interesting place to fly, while Papua New Guinea is one of the hardest places ” the weather comes up and bites you,’ he said.